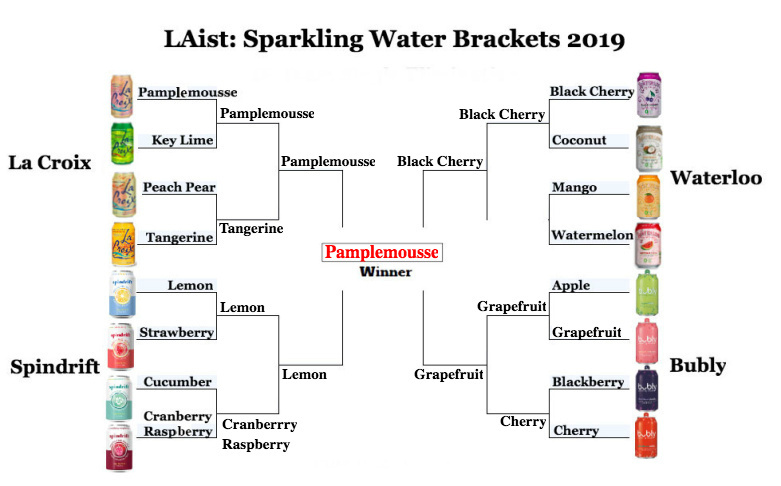 A few weeks ago, after taking your suggestions via social media, we debuted our 2019 Sparkling Water Brackets — aka our version of March Madness. As we explained, we eliminated brands that we don't often see in SoCal and store brands, which broke the heart of this writer, who is a ride-or-die fan of Simply Balanced's ginger peach. We also eliminated brands that don't produce many flavors of sparkling water, like Topo Chico, smartwater sparkling, Perrier and Pellegrino. That left us with four brands of sparkling water: La Croix, Waterloo, Bubly and Spindrift. We set up a poll with ranked voting, meaning you only had to vote once and, through the magic of analytics, our data editor, Dana Amihere, could determine the semifinalists, the finalists and the winners. No surprise there. La Croix is probably the most popular flavored sparkling water brand and it launched the current boom in this beverage category. Plus, citrus flavors rank near the top for every sparkling water brand, so it makes sense that Bubly's Grapefruit flavor came in second and Spindrift's Lemon came in third. Waterloo's Black Cherry, another personal favorite of this writer, rounded out our Final Four. As for your least favorite flavors... La Croix's Peach-Pear? Who are you people? What is wrong with you? This is a delicious flavor. I am shocked and saddened. But I totally agree with y'all about ranking Spindrift's Cucumber flavor near the bottom. Anything that tastes like cucumber but isn't a cucumber is not good. Although I'm also a fan of Waterloo Coconut, I know coconut is a very specific preference so I'll accept the wisdom of the masses on this matter. What choice do I have? Bottoms up. Now, go yell at a TV screen about people dribbling a basketball.